Draft: 2008, Colorado Rockies, 2nd rd. Charles Cobb Blackmon … son of Myron and Ellen Blackmon, he has one younger sister, Katie … resides in Atlanta, Ga., in the offseason...Born in Dallas, Tex., but was raised in Suwanee, Ga...Attended North Gwinnett High School, where he played baseball, basketball and football … three-time Academic Player of the Year...Was a Dean's List student at Young Harris College, where he pitched and helped lead the Mountain Lions to back-to-back GJCAA titles...Transferred to Georgia Tech where he made the full-time transition from pitcher to outfielder … earned his Bachelor of Science in business administration with a concentration in finance from Georgia Tech in the fall of 2011 (while on the disabled list with a broken foot)...He and his father both participated in the 2016 Rockies Fantasy Camp at Salt River Fields...He is a big fan of Star Wars...Enjoys the outdoors and fishing in his free time...Twitter handle is @Chuck_Nazty … Instagram is @chuck__nazty. Was an All-Star for the second consecutive season (third time overall) … signed a six-year contract with the Rockies, including two player options, on April 4 ... Started in center field in all four postseason games … went 2-for-15 (.133) with one run, one RBI and one walk ... Led the NL with 119 runs scored, his second straight season leading the National League in runs … tied for fourth in the league with a team-high 182 hits, and finished tied for seventh with 51 multi-hit games ... Recorded his third straight season with at least 100 runs scored and 25 home runs … joined Willie Mays and Duke Snider as the only NL center fielder with three consecutive 100/25 seasons ... Hit for his first career cycle, the ninth cycle in Rockies history, in the 162nd game of the season, the first cycle in the 162nd game of the season in Major League history ... His 17-game hitting streak Sept. 8-25 tied for the longest hitting streak in the National League in 2018, and was the longest by a Rockies player since Carlos González's 19-game streak in 2016 ... Finished the season with 14 career hitting streaks of 10 or more games, including three in 2018, the third-most such streaks in club history behind Todd Helton (25) and Larry Walker (17) … his 13 double-digit hitting streaks since 2015 are the most in MLB ... Hit his first career walk-off home run on July 25 vs. Houston in the 3-2 Rockies win … it was his second career walk-off RBI (also: Sept. 1, 2014 vs. San Francisco) ... Recorded his 1,000th career hit Aug. 7 vs. Pittsburgh, the seventh player in franchise history to reach that mark with the Rockies ... Played in his 900th career game on Sept. 10, the seventh player in franchise history to reach that mark, the third player drafted by the Rockies to do so (also: Todd Helton, Troy Tulowitzki) … his 1,038 hits through 900 games were the fourth-most through 900 games in franchise history, trailing Dante Bichette (1,136), Larry Walker (1,088) and Helton (1,072). Became the first center fielder to win the National League Batting Title since Willie McGee with the St. Louis Cardinals in 1990...Won his second consecutive Silver Slugger Award after leading the Major Leagues in hits (213), runs (137), triples (14) and total bases (386)...Set career highs in batting average (.331), games (159), runs (137), hits (213), triples (14), home runs (37), total bases (387), RBI (104), walks (65), on-base percentage (.399) and slugging percentage (.601)...His 213 hits were the fourth-most in franchise history, the most for a Rockies player and in the National League since Matt Holliday had 216 in 2007...Set a Major League record with 103 RBI from the leadoff position, surpassing Darin Erstad's previous mark of 100 set with the Angels in 2000...His 383 total bases from the leadoff position were also the most all-time … 37 home runs were the thirdmost all-time by a leadoff hitter, trailing Alfonso Soriano's 38 in 2002 with the Yankees and 39 in 2006 with the Nationals...Recorded 86 extra-base hits, the third-most by a leadoff hitter in Major League history and the most by a NL leadoff hitter...His 68 multi-hit games were a franchise record and the most in the National League since 2004 (Mark Loretta, Juan Pierre)...Became one of seven players (eight times) in MLB history to record at least 135 runs, 210 hits, 35 doubles, 14 triples, 35 home runs and 100 RBI in a single season … joins Stan Musial (1948), Joe DiMaggio (1937), Chuck Klein (1932), Al Simmons (1930), Lou Gehrig (1930, 1927) and Rogers Hornsby (1922)...Named the National League Player of the Month in May after batting .359 with 24 runs, six doubles, five triples, six home runs and 22 RBI … led the National League in hits, batting average and triples, tied for the lead in extra-base hits and finished fifth in RBI … his 42 hits tied the club record for hits in the month of May … the NL Player of the Week for May 22-28, after hitting .400 (12-for-30) with three home runs, 12 RBI, six runs scored, a double, a triple, and a stolen base over seven games...Selected by the MLB Players Alumni Association as the Rockies' 2017 Heart and Hustle Award Winner...Voted by the fans as the starting center fielder for the NL in the All-Star game, his second career All-Star selection and first career start … participated in the Home Run Derby and hit 14 home runs. Set career highs in runs (111), hits (187), doubles (35), home runs (29), RBI (82), batting average (.324), on-base percentage (.381) and slugging percentage (.552) … won Silver Slugger for the first time...Finished fourth in the National League in batting average, third in runs, fourth in hits, fifth in slugging percentage and fifth in total bases (319)...Led NL outfielders in batting average, slugging, hits and runs … his 29 home runs were tied for fifth...His 29 home runs as a leadoff hitter were the most in Major League Baseball and the most in the National League since Alfonso Soriano and Hanley Ramirez hit 29 and 32 home runs, respectively, in 2008 … the 29 home runs are tied for the seventh-most by a leadoff hitter in NL history...His 82 RBI from the leadoff spot were tied for the fourth-most in National League history, the most since Jimmy Rollins recorded 82 RBI in 2006...Led MLB with 10 leadoff home runs … became the fifth player in Major League history to record double-digit leadoff home runs in a season, the third in National League history (Alfonso Soriano, 12, 2007; Bobby Bonds, 11, 1973)...Batted .335 (93-for-278) with 12 home runs at home, .313 (94-for-300) with 17 home runs on the road … batting average on the road was the 10th-highest in the NL and the seventh-highest for a single season in franchise history, the highest since Todd Helton batted .326 (88-for-270) on the road in 2004...Missed much of April, playing in 10 games … on 15-day disabled list due to left foot injury (turf toe) from April 14-29 … played two games for High-A Modesto on a rehabilitation assignment...Hit .331 (58-for-175) vs. left-handed pitchers, the sixth-highest average vs. lefties in the National League and the best among left-handed batters...Had five hitting streaks of 10 or more games, tied for the most such streaks in Rockies history (Larry Walker, 2002; Eric Young, 1996) … the five streaks of at least 10 games were the second-most in baseball behind Dustin Pedroia's six streaks...Had five multi-home run games, including a three-homer game Aug. 12 at Philadelphia … became the 11th Rockies player to hit three home runs in a game (15th time)...Five home runs in the three-game series at Philadelphia Aug. 12-14, the most in a three-game series in franchise history and tied for the most in any series in franchise history (Todd Helton, 1999 vs. Montreal, five games)...Hit .360 (40-for-111) in August with a NL-leading 11 home runs and 30 runs scored...Named the NL Player of the Week twice, June 20-26 and Aug. 8-14...Career-long 14-game hitting streak from July 5-22, batting .317 (19-for-60) … career-long 32-game on-base streak May 3-June 6 … batted .331 (43-for-130) with a .390 on-base percentage over that span...Recorded his 101st career stolen base on Sept. 23, tying him with Willy Taveras for fifth on the Rockies' alltime stolen base list. Had career-year in 2014, earning his first selection to the NL All-Star team...was voted to the team via the player vote...went 0-for-2 in the game and played center field as a reserve...Was a member of the Rockies Opening Day roster for the first time in his career and started in center field on Opening Day...played a team-high 154 games...Set career-highs in virtually every category in '14, including: games, at-bats (593), runs (82), hits (171), doubles (27), triples (3), home runs (19), RBI (72), walks (31) and stolen bases (28)...Finished among the top-20 in the NL in hits (11th), runs (17th), average (.288, 15th), total bases (261) and stolen bases (T-8th)...led the Rockies in hits, runs and steals and finished third in RBI and home runs...Played the majority of the season as the Rockies leadoff hitter...led all NL players from the leadoff spot in RBI (69) and was second in home runs (19)...his five leadoff home runs established a new Rockies franchise record...Had one of the single greatest games in Rockies history during the Rockies Home Opener on April 4 vs. Arizona...went 6-for-6 with three doubles, one home run, five RBI and four runs...six hits tied a Rockies record originally set by Andres Galarraga (6-for-6, July 3, 1995 vs. Houston)... Blackmon became the 10th player since 1920, when RBI became an official statistic, to go 6-for-6 or better with that many RBI and runs scored in a game...Had three games in 2014 of 5-for-5 or better...went 5-for-5 July 12 vs. Minnesota and 5-for-5 Sept. 17 vs. Los Angeles-NL...Elias: is the fifth player since 1900 to record at least three games of 5-for-5 or better, joining Hall-of-Famers Ty Cobb (1922), Tris Speaker (1923), Stan Musial (1948) and Tony Gwynn (1993), plus Ichiro Suzuki in 2004...Had his first career multi-home run game on April 21 vs. San Francisco, first going deep off Ryan Vogelsong and later off Juan Gutierrez...was one of six multi-HR games for a Rockie in 2014...Was one of the Rockies most clutch hitters in '14 and batted .320 (41-for-128) with 53 RBI with runners in scoring position...also fared well against the division, batting .305 (83-for-272) with 13 doubles, 11 home runs and 36 RBI vs. NL West. Split the season almost evenly between Triple-A Colorado Springs, where he began the campaign, and in the Majors with the Rockies... Blackmon played in a career-high 82 games in the Majors and set career-highs in nearly every offensive category, including: at bats (246), runs (35), hits (76), doubles (17), home runs (6), RBI (22), OBP (.336), SLG (.467) and OPS (.803)... Was first recalled from Triple-A on 5/12 and spent 17 days on the active roster before being optioned back to Triple-A on 5/29...was recalled for the remainder of the season on 7/8...hit .288 (74-for-257) with 15 2B, 6 3B, 3 HR, 40 RBI, 56 runs in 68 games at Triple-A... Played 52 of his 82 total games in August and Spetember and combined to hit .332 (61-for-184) with 14 doubles, 1 triple, 5 home runs, 18 RBI over the season's final two months... Blackmon's 9 doubles in September were tied for the 5th-most in the NL with teammate Todd Helton (Matt Carpenter led with 12 2B in September)... Split his time between the three outfield spots, playing 17 games in left, 25 games in center and 34 in right... The left-hander hit .296 (21-for-71) vs. LHP in 2013 and is now a .325 (37-for-114) career hitter vs. LHP in the Majors... Was productive with men on base, as he batted .304 (24-for-79) with 6 doubles, 1 home run and 17 RBI with runners on base and .304 (14-for-46) with 5 doubles, 1 home run and 15 RBI with runners in scoring position. Began the 2012 season on the 15-day disabled list with turf toe in his left big toe, then spent the first four and a halfmonths in the Minors prior to his recall from Triple-A on 8/18. 2012 marked his second-straight year seeing time in the Majors with the Rockies...hit .146 (6-for-41) in his first 13games, all in August...then hit .361 (26-for-72) over his final 29 games...had 5 doubles, 2 home runs and 8 RBI from9/1 through the end of the season. Batted .289 (83-for-287) with 23 doubles, 4 triples, 6 home runs and 37 RBI in 76 Minor League games between ShortSeason-A Tri-City and Triple-A Colorado Springs. Tied his career-high with 4 hits twice in 2012, and now has three four-hit games in his MLB career...had 4 hits, including a double, on 9/6 at ATL...then had 4 hits again on 10/1 at ARI...had 8 multi-hit games in 2013. Saw time at all three outfield positions, though split his time nearly evenly between left field (114.2 innings) and rightfield (107.1 innings). After spending the first two months of the 2011 season at Triple-A Colorado Springs, was recalled on 6/7 and spent thenext month, until 7/7, on the active roster...finished the season on the 60-day disabled list with a right foot fracture suffered 7/7 at ATL while rounding second base...Hit .255 (25-for-98) with 1 double, 1 home run, 8 RBI, 9 runs and 5 steals in his 27 games with the Rockies...playedmostly left field, though he also saw action in center field as well...Collected his first Major League hit in his second game, 6/8 at SD off Dustin Moseley, with a single going 1-for-4 in thegame....first MLB multi-hit game, RBI and outfield assist all came 6/11 vs. LAD...Had a career-high four hits 6/17 vs. DET...also drove in two runs, setting his career-high for RBI in a game as well...Slugged his first career home run on 7/1 vs. KC off Soria...was a pinch-hit home run and also came on his 25th birthday...in his 15 games at Coors Field, Blackmon hit .382 (21-for-55) with a home run and 7 RBI...Had 5-straight games with a stolen base from 6/11-15...since 1946 (when game-by-game data began), he was the firstplayer to steal a bag in 5-straight games within his first nine career games (Stats LLC. )...Hit .337 (82-for-243) with 10 home runs, 19 doubles, 4 triples and 49 RBI while stealing 12 bases in 58 games for theSky Sox...he led all Sky Sox in doubles, homers, stolen bases, RBI and batting average prior to his recall...collectedfive multi-hit games and hit .370 (13-for-42) in his final 10 games with the Sky Sox. Spent the entire season at Double-A Tulsa as the club's regular center fielder...hit .297 (100-for-337) with22 doubles, 4 triples, 11 home runs and 55 RBI in 86 games for the Drillers...his .484 slugging percentagewas a career high, and his .834 OPS was a personal best for a full season club...The left-handed batter was equally as effective against left-handed pitchers (.303 average) as he wasvs. right-handers (.293)...Blackmon had 13 extra-base hits in 122 at-bats against lefties in 2010...Finished his season strong by batting .348 (40-for-115) with 10 doubles, 3 triples and 3 home runs in 28games during the month of August...his .565 slugging percentage and .961 OPS were by far his best ofany of the three full months he played in 2010...Missed nearly all of the first two months of the season due to injury, and did not make his 2010 debutuntil 5/31 at Frisco...Regularly batted either first or second in the Drillers lineup in 2010, though he was still able to averageone RBI every 6.1 at-bats...in fact, he finished 2nd on the club with his 55 RBI despite missing twomonths, and playing the majority of his games as the first or second hitter in the lineup...Was at his best with men on base, as he hit .309 with runners on, compared to .286 with none on...hisbatting average splits with runners on base for 2010 were: scoring position-.313, runners on with 2 outs-.328, runners in scoring position with 2 outs-.315 and bases loaded-.417...Played in the Arizona Fall League as a regular outfielder for Scottsdale...hit .264 (19-for-72) with 2 doubles,3 home runs and 11 RBI...had 13 walks compared to just 6 strikeouts during the AFL...Named the Rockies 11th-best prospect by Baseball America following the season. Played his entire second professional season with High-A Modesto in the California League...ledthe Nuts in hitting (.307, 169-for-550), RBI (69), stolen bases (30) and runs scored (30)...led the club in RBIdespite being the primary lead-off hitter...his 34 doubles were the second-most on the club...hit .305 (65-for-213) vs. left-handers and .309 (104-for-337) vs. right-handers...was the club's primary center fielder, and committedjust 3 errors on the season...batted .316 (89-for-282) after the All-Star break, compared to .299 (80-for-268) prior to the break...hit .357 (46-for-129) with runners in scoring position...named the club's 13th-bestprospect by Baseball America following the season. In his first professional season led Tri-City with a .338 (98-for-290) average while playing most ofthe season as the club's regular center fielder...named the Rockies Organizational Co-Player of the Monthfor the month of July along with Wilin Rosario...hit .344 (42-for-122) with 11 extra-base hits and 14 RBI duringthe month, his first full month in professional baseball...was named to the Northwest LeaguePostseason All-Star team...was named the Northwest League Player-of-the-week for the week of 7/13when he hit .565 (13-for-23) with 4 doubles, 5 RBI and 6 runs scored...named the 10th-best prospect in theNorthwest League after the season by Baseball America...also tabbed by the same publication as theRockies 10th-best prospect. April 29, 2016 Colorado Rockies activated RF Charlie Blackmon from the 15-day injured list. April 26, 2016 Colorado Rockies sent OF Charlie Blackmon on a rehab assignment to Modesto Nuts. July 8, 2013 Colorado Rockies recalled CF Charlie Blackmon from Colorado Springs Sky Sox. May 29, 2013 Colorado Rockies optioned Charlie Blackmon to Colorado Springs Sky Sox. May 12, 2013 Colorado Rockies recalled Charlie Blackmon from Colorado Springs Sky Sox. March 24, 2013 Colorado Rockies optioned Charlie Blackmon to Colorado Springs Sky Sox. October 14, 2012 CF Charlie Blackmon assigned to Toros del Este. August 18, 2012 Colorado Rockies recalled Charlie Blackmon from Colorado Springs Sky Sox. August 18, 2012 Charlie Blackmon roster status changed by Colorado Rockies. July 4, 2012 Charlie Blackmon roster status changed by Colorado Springs Sky Sox. June 7, 2012 Colorado Springs Sky Sox sent CF Charlie Blackmon on a rehab assignment to Tri-City Dust Devils. April 14, 2012 Colorado Rockies optioned CF Charlie Blackmon to Colorado Springs Sky Sox. April 14, 2012 Charlie Blackmon roster status changed by Colorado Springs Sky Sox. April 13, 2012 sent OF Charlie Blackmon on a rehab assignment to Colorado Springs Sky Sox. 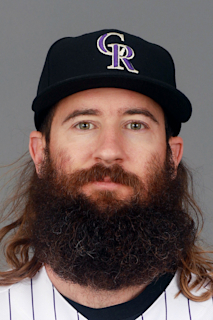 April 4, 2012 Charlie Blackmon roster status changed by Colorado Rockies. October 31, 2011 Colorado Rockies activated CF Charlie Blackmon from the 60-day disabled list. July 15, 2011 Colorado Rockies transferred CF Charlie Blackmon from the 15-day disabled list to the 60-day disabled list. June 7, 2011 Colorado Rockies selected the contract of CF Charlie Blackmon from Colorado Springs Sky Sox. April 7, 2011 Charlie Blackmon assigned to Colorado Springs Sky Sox from Tulsa Drillers. February 8, 2011 Colorado Rockies invited non-roster CF Charlie Blackmon to spring training. August 31, 2010 Charlie Blackmon assigned to Scottsdale Scorpions.